As the first to be called by Jesus Christ into his service, St. Andrew commands a reverence a degree greater than those who have followed. For this reason, St. Andrew is called Protokletos, or "First-called." St. Andrew, like his brother St. Peter, was a fisherman, a toiler with net and boat recognised in the Psalms of the Old Testament as one of those "who go down to the sea in ships, that do business in great waters; these see the works of the Lord and his wonders in the deep." His love of the sea stemmed from his love of the Creator who made it, and the perils of the sea which he challenged daily forged the character with which he boldly assailed the seas of ignorance and paganism in the sacred trust that had been placed in his keeping. St. Andrew, who lived in the Holy Land in the ancient city of Bethsaida, accepted Christ with all his heart and after a discipleship with St. John the Baptist went forth to become one of the greatest missionaries in all history. When the apostles drew lots to determine their sphere of labour for the Saviour, St. Andrew exulted in his mission to preach in Asia Minor, part of Greece, and an area along the coast of the Black Sea, including its gateway, the city now known as Istanbul, or Constantinople. Wherever St. Andrew went he attracted throngs of people who thirsted for a spiritual knowledge. His message of deliverance was so eloquently convincing, even to hostile minds, that he is credited with having converted countless thousands to Christianity in a day when mass media did not exist. As an apostle, his only tools were his power of oratory and his love for Jesus, and his only press agent was the word of mouth of those privileged to hear his homilies. St. Andrew came to Jerusalem for the First Synod of the Apostles, about 50 AD, another historic first for him and the other apostles, some of whom he had not yet met. There he rejoiced in joining the great St. Peter together with those but for whom Christianity might never have become the glorious human experience it is today. Out of the Synod, the apostles went forth with renewed vigour to establish the ecclesiastical system. St. Andrew alone is credited with having set up parishes throughout Asia Minor, in Pontos, Bithynia, Thrace, Macedonia, Greece, Scythia (Russia, where he is still regarded as patron saint) and in the capital city of Byzantium. It was in Byzantium that St. Andrew ordained Stachys as first bishop of Byzantium (later Constantinople), thereby establishing an unbroken line of 270 patriarchs down to the present day Patriarch Bartholomeos 1st. 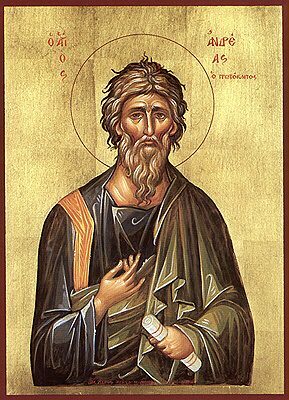 From Byzantium, St. Andrew went on to more glory through his compelling oratory and power of healing through Jesus Christ. He eventually found himself in Achaia, in the city of Patras, where he was to suffer death. St. Andrew committed the grave crime in the eyes of the state of converting Maximilla, wife of the ruler Aigeates, to Christianity. Despite the fact that he was then eighty years old, it was ordered that he be put to death by being nailed upside down to an X-shaped cross. After three days of agony on this vile device, St. Andrew died. The great fisherman had cast his net for Christ for the last time. St. Andrew's remains were brought to Constantinople two hundred years later and in 1460 his head was given to the pope. On 24 September 1964, in an ecumenical gesture, the head was returned to the people of Patras by the pope.